Scamorza is an Italian cow's milk cheese, available in most Italian delis. If you can't find it, use mozzarella instead. The smoked scamorza lends a smoky depth to sauces and whatever it touches. It is also pretty bloody good on its own, eaten from the packet. This is a variation on a recipe given to me by my girlfriend Emma. Start with salting the eggplant. Slice it lengthwise, put it on a kitchen towel, and sprinkle it with salt. Turn after 20 minutes or so, and do the other side. Rinse and dry thoroughly. Make the pesto in a big mortar and pestle by grinding up the garlic. Add the basil, keep mashing away, and then add the pine nuts. Slowly add the olive oil, and then the Parmesan. Season to taste. Preheat the oven to 350 degrees. Put all the eggplant slices in an ovenproof dish and give them a good dash of olive oil. Bake for around 10 minutes. 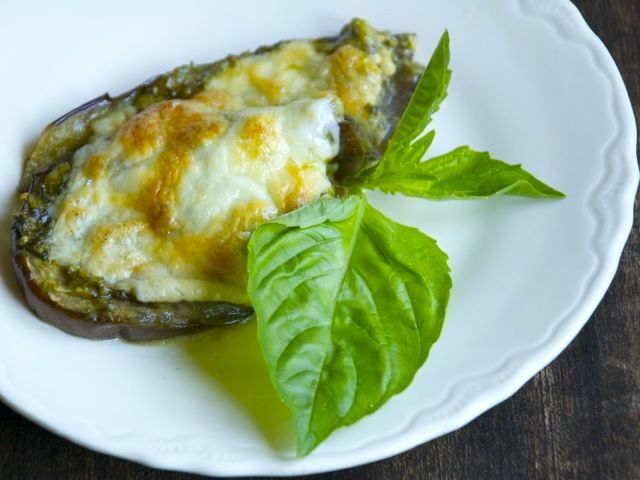 Take out of the oven and spread the pesto on the layer of eggplant, then add a layer of cheese. Repeat the layering process until everything is used up. Bake for around 30 minutes and serve with a crisp green salad.